Back in October the kids each sang a Luxembourgish song for the camera. James decided to re-attempt his a couple weeks later. This week Daphne wanted to try hers again too. Although she's not able to translate the whole song word for word yet, she can tell us bit more about it. 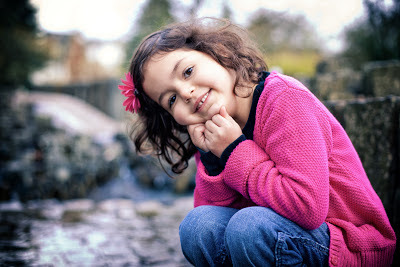 Her summary: I am me, you are you, you would be sad if you were someone else, so stay you and be happy being who you are. Something like that. Anyway, I'm just documenting some of the progressions in hopes that it will be meaningful and interesting to look back on someday. 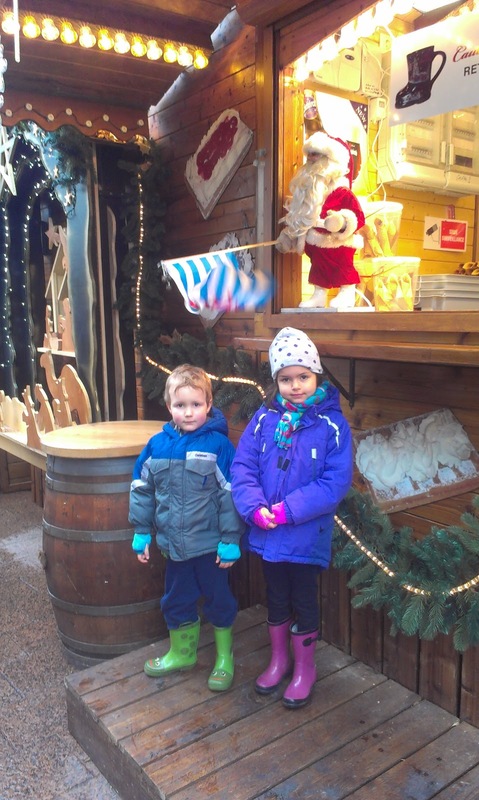 Here's a Luxembourgish song about Santa Claus! Wishing you all a Merry Christmas, both near and far! 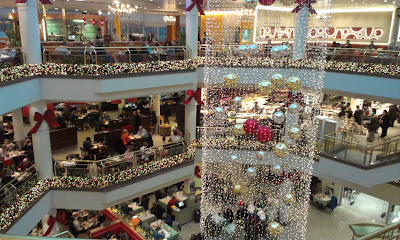 I'm not a shopping mall connoisseur, but I've dined at few American mall food courts in my day. Those of you fellow West Coasters will recognize that I use the term "dined" loosely. I don't know how it works in other parts of the U.S., but a west coast food court is a fairly self-serve, casual experience. 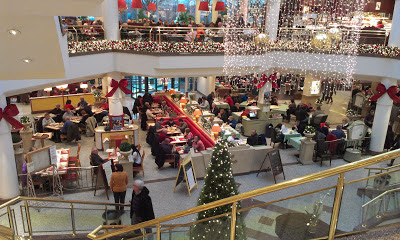 In contrast, a Luxembourg mall food court consists of several "regular" restaurants that have spilled out and mingled into the common mall area. Sharp-looking servers and hosts, plush booths, nice place settings, wine - the works. the lamps are a nice touch, eh? 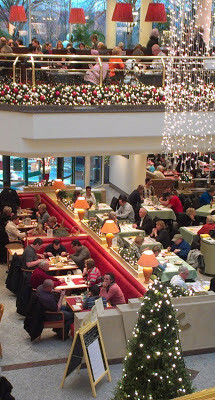 Maybe it's all still casual by European standards, but it sure looks fancy to those of us who equate mall dining with standing in line to grab your Subway sandwich or plate of cheap Chinese food, and then locating (and often self-bussing) a random empty table. 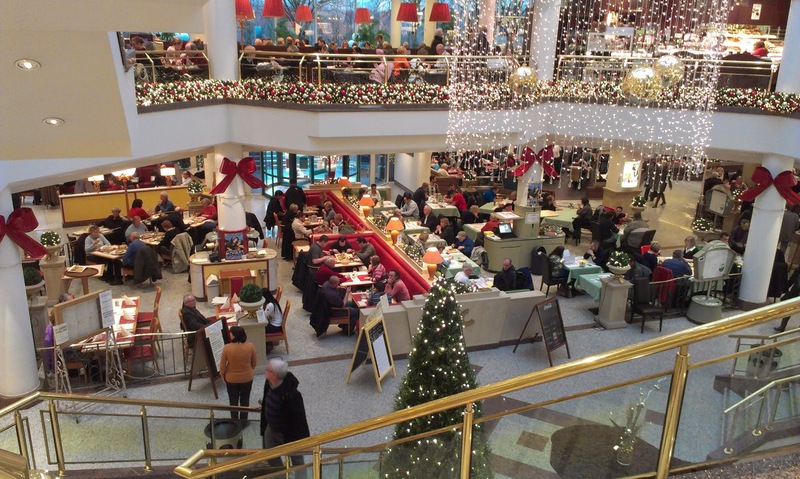 Sure, there are often mid-range restaurants within a mall, but they are typically more self-contained and segregated from the rest of the non-dining shoppers. At mealtime, these Lux food courts are jam-packed (and not just during the holidays). Someday we will have to dine at a mall restaurant to see what it's all about. I'll let you know when we do. Maybe someone in Luxembourg can tell us their favorite one? One reason we often cite for our bucking of the American stereotype is that we favor smaller living spaces. We also like to think outside the box regarding arrangement of rooms. After gradually purging our master bedroom in our house back in the States down to just our bed, we converted the oversized room into a multipurpose/bonus/music room. We repurposed the master closet as storage for all the kids' games and toys, and roomed the kids together in one small bedroom with only their beds and clothes (no dresser, etc). Pete and I and took the other small bedroom and closet as our master, also with just our bed and clothes. converted master bedroom - why waste all this space for just a bed?!? We left no furniture or any other possessions back in the U.S.--everything we own is here--but we still don't have a lot of furniture. I would guess that people who don't know us well walk into our Lux apartment and think we left a bunch of stuff in storage in the U.S. 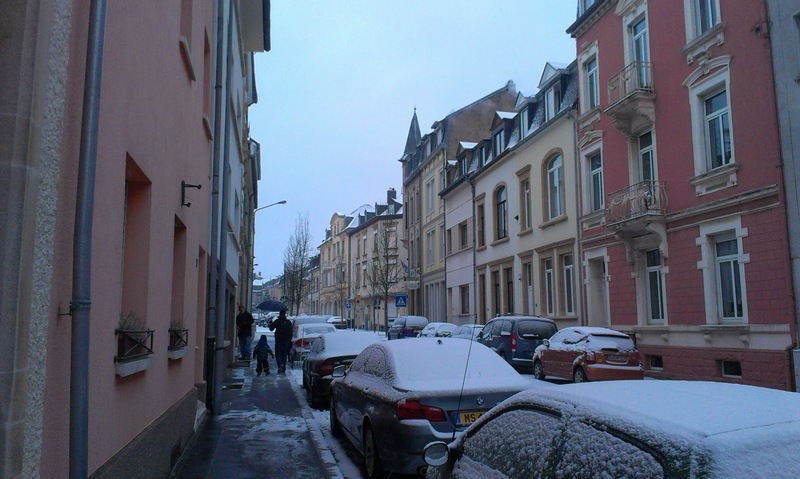 In general, living quarters in Luxembourg can actually be quite large, even apartments. Yet a distinguishing feature of many European dwellings (and I suppose many older homes in the U.S) is that there is a lot of extra separation by walls and doors. Often there are closing doors on the kitchen, dining room, living room, etc. in addition to bedrooms and bathrooms. Even though we like small, one of our favorite things about our apartment is the unique feature that the living and dining room is one continuous, large rectangle. When we first visited this apartment, I think this room called out to us, "flexibility!" 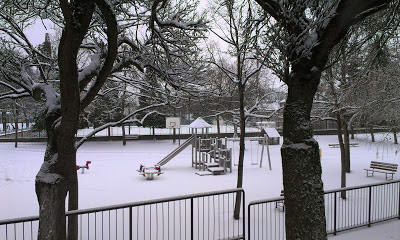 even though at the time it was filled to the brim with tables, chairs and bookshelves. At some point along the way, Pete or I made the joke that we could play table tennis in here. And at some point along the way, I suggested that we actually buy a table. Let me emphasize, I suggested it. 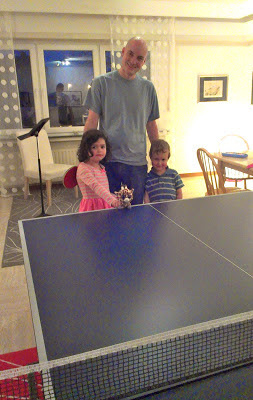 If you know Pete and his love for table tennis, I think we can agree I score major wife-points for this. We started looking on Amazon, but no tables would ship to Luxembourg. About a month ago, Amazon began shipping "heavy/bulky" to Luxembourg from Germany. Accordingly, one of their inaugural heavy/bulky shipments was our very own ping pong table. Fewer possessions overall gives us the flexibility to focus what we do own on specific things we enjoy, instead of owning a lot of everything with not much leftover flexible space. Playing table tennis is a great reason to have people over to hang out. "Having people over to hang out" is one of our main hobbies, fostering community is one of our core values, and it's free. 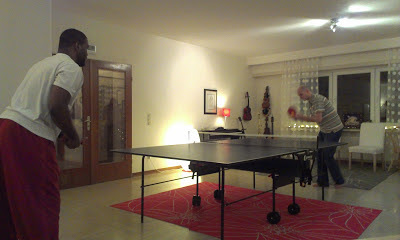 When you're inviting someone over, sometimes it's nice to have the option of adding, "to play some table tennis." Think of it as an oversized ice-breaker. You can also trash-talk chat while you play (depending on how serious you are about your table tennis, I suppose). We fold it up and wheel it to the guest room when not in use. There's not much furniture in there either so there's plenty of room, and our kids already share a bedroom. It's multipurpose! We have a small, lightweight dining table, but with a couple of table cloths, the ping pong table doubles as a portable banquet table! (net optional). We decided that it would be worth 200 Euros for us to just rent a ping pong table for a year. So even if we decide to keep it for awhile and then sell it or even give it away, it's worth it to us. Buying a ping pong table for our apartment living room was definitely an oddball move, especially considering we are a "family of four" and not "a bachelor," but the more we thought about it, it just seemed very "us" and the right thing to do. Lining up your possessions with your personality and values is core to minimalists thinking. So there you have it. Come play! This past Wednesday on 12/12/12, our Daphne turned siwen ("zeevuhn"). 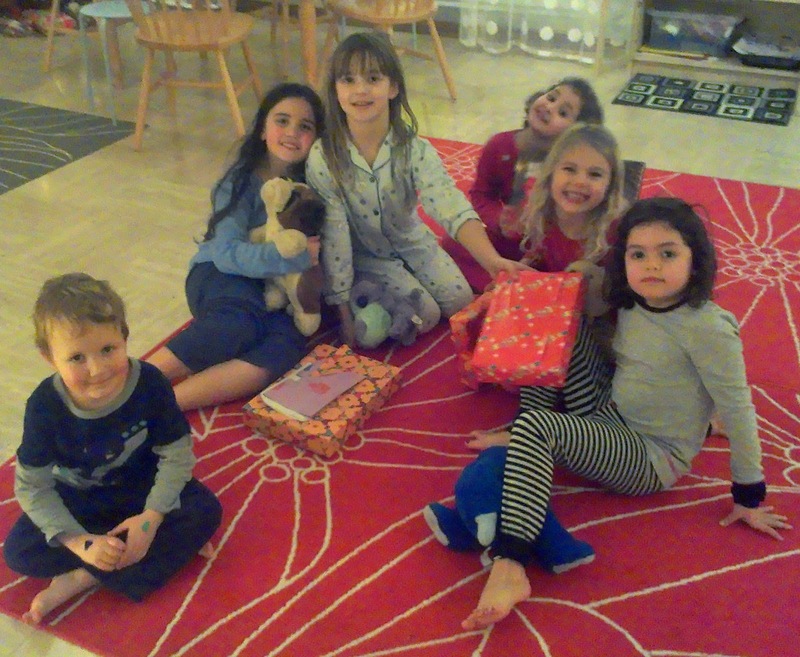 On Friday she had a non-sleepover pajama party with a few friends from school. 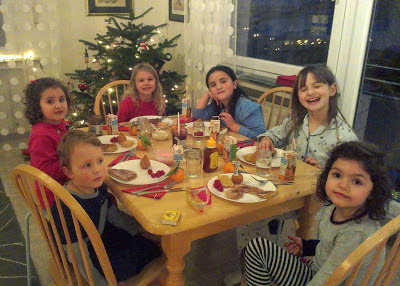 They ate American pancakes with various toppings. 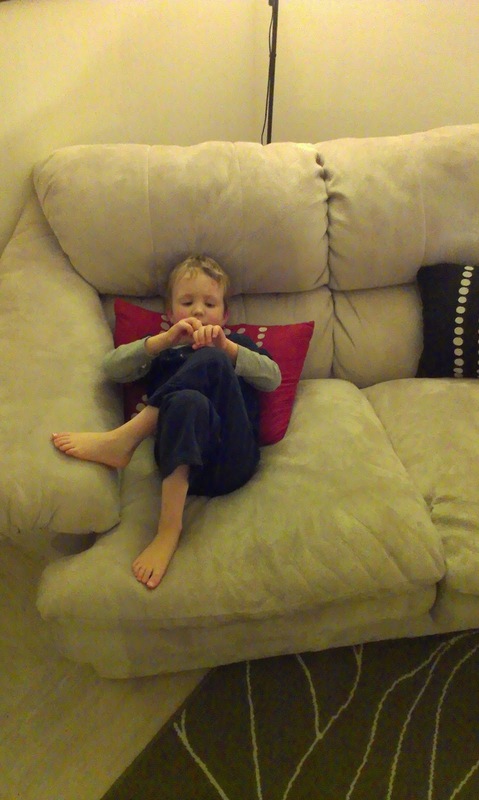 Once again, video chat was open during the party, allowing the grandparents to check in. As I suspected it would be, this party was just about as loud and crazy as James' party, and perhaps even louder with the high-pitched-girl-screaming. I think they were playing a monster-chase game of some sort. Pete took this picture as we were frantically Googling how to calm them down in French and German, as to not (further) anger the neighbors. 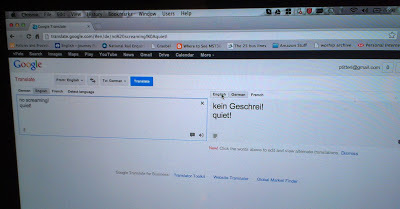 apparently they were just ignoring us because Quiet = Quiet in German?!?! The girls finally calmed down after awhile, around the time when the art supplies came out. It was fun to see them all communicating in Luxembourgish, especially when Daphne was able to participate in the conversation at a very functional level. 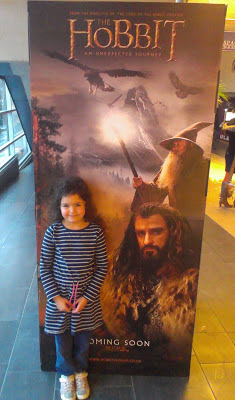 Then this afternoon she and Pete went to The Hobbit. 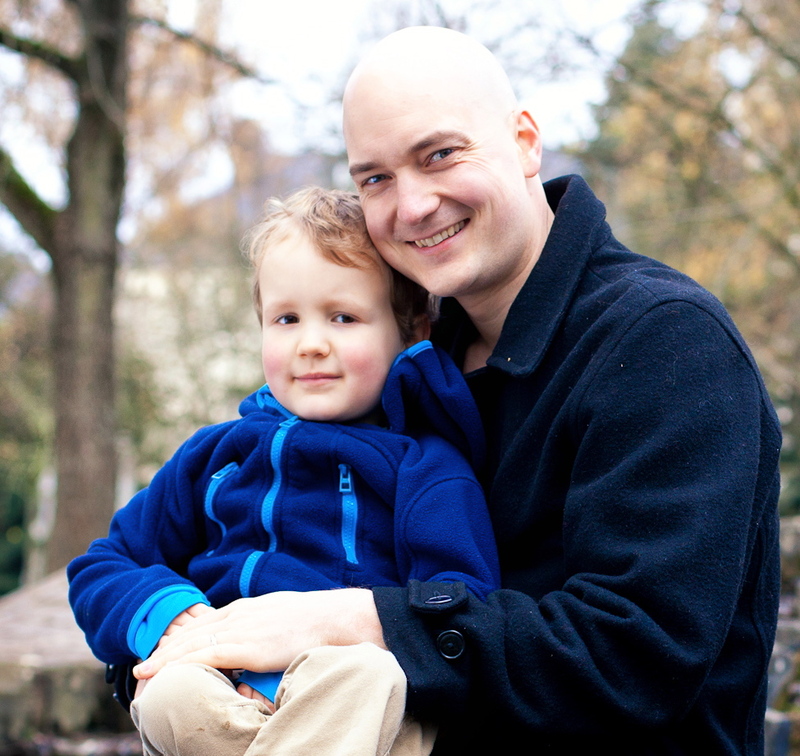 Pete's birthday is in a couple of days, and they've been planning this dual-birthday-daddy-daughter-date ever since they finished the book this spring. 2 more Hobbit movies, 2 more birthday dates to go! Daphne reports that she enjoyed the movie, although it was probably a bit too scary at times. Her favorite part was the song the dwarves sang. Upon arriving at home she immediately headed to the piano to work out the tune. 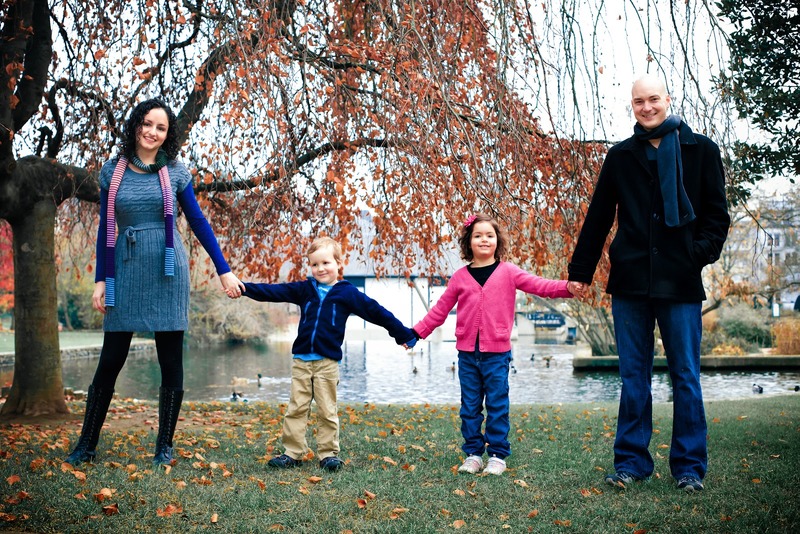 This is the story of four Christmas trees - two Oregon trees, and two Luxembourg trees. 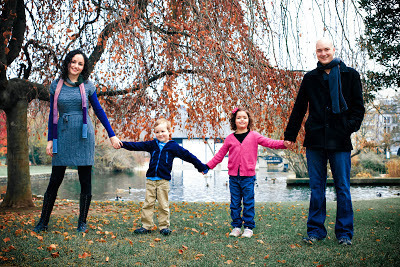 For December 2011, I decided we should get a real tree. By this point we were solidly in the minimalist camp, and I was tired of awkwardly storing our tree wrapped up in a garbage bag under the stairs all year long. I decided I would much rather store a little Christmas tree stand - smaller and less awkward. 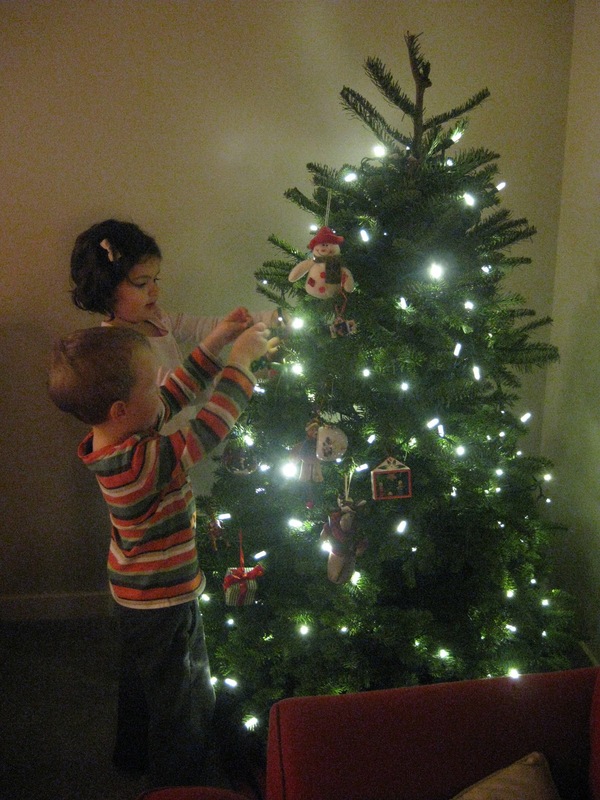 Also, I think I just missed having a real tree (we always had them growing up), and I wanted the kids to enjoy the experience. 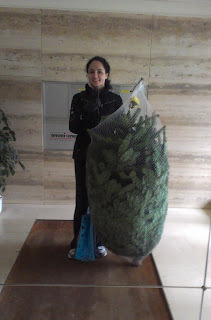 So we picked out a tree at a local parking lot-lot. 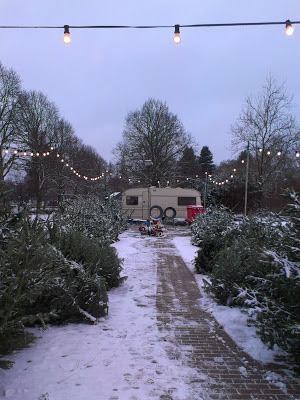 And, I have to say, I loved the real tree, especially the smell. 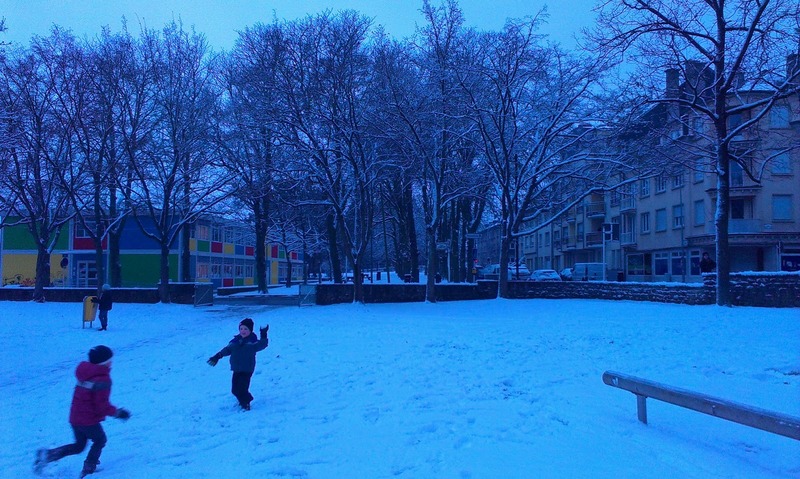 Before we moved to Luxembourg, we sold or otherwise ditched everything that wasn't imminently useful. 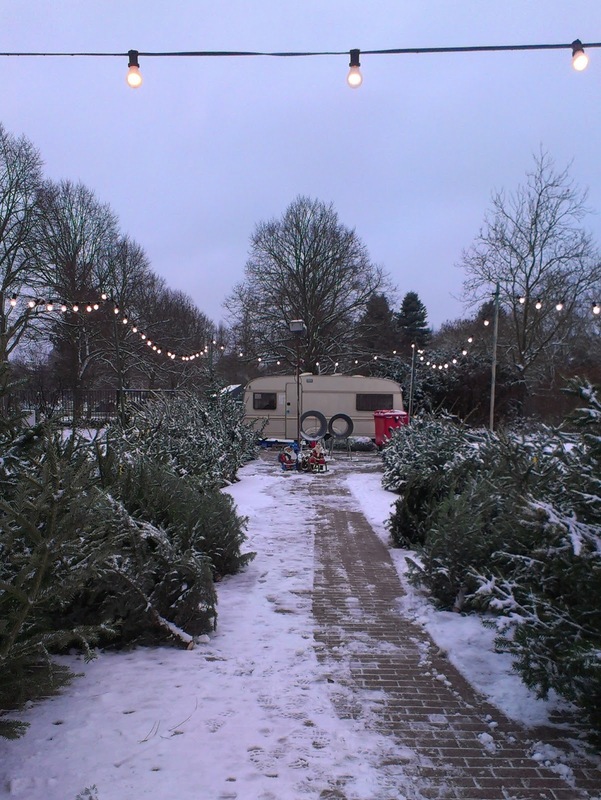 The stand we had purchased from the tree lot out of convenience wasn't the greatest, and we didn't know what our tree situation would be in Luxembourg, so we gave it up. 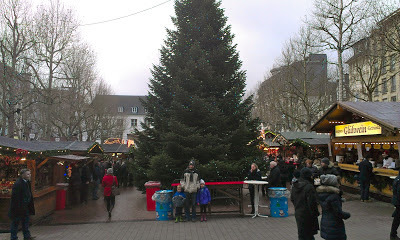 Around mid-November I started thinking about what we might do for a Christmas tree in Luxembourg this year. I had already seen a few questions/comments regarding where to acquire real trees on the American Women's Club of Luxembourg Facebook page. Most suggestions were places like Ikea, Cactus (hypermarket), and Hornbach (hardware store) - but all these options were far away and not really doable without a car. Artificial trees at Auchan (a hypermarket that's much easier by bus from our place than these other locations) were extremely expensive. Of course, at this point, I was wishing we still had our old $8 tree! But, as usual, Amazon came to the rescue. I found a 5 ft tree on Amazon.de (Germany) for around 15 Euros. This seemed a quite sensible option for a frugal family with no car. 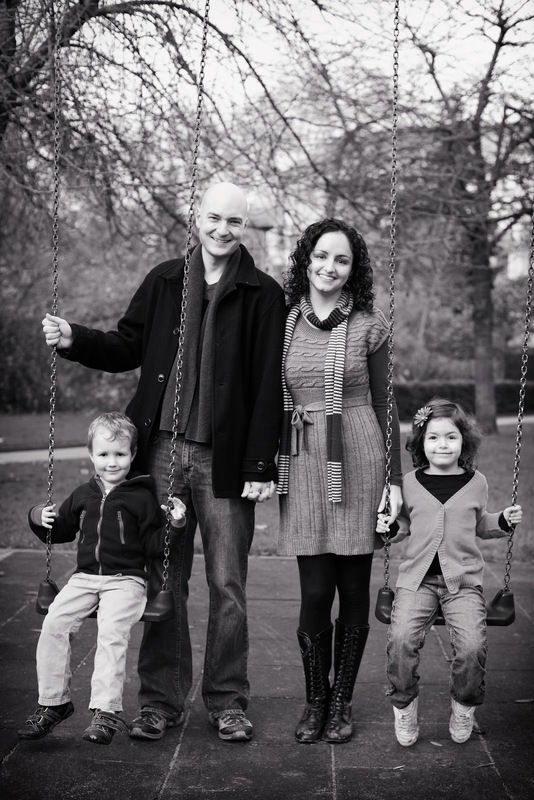 One slight hitch remained: it was through a 3rd party seller and would only ship to Germany. 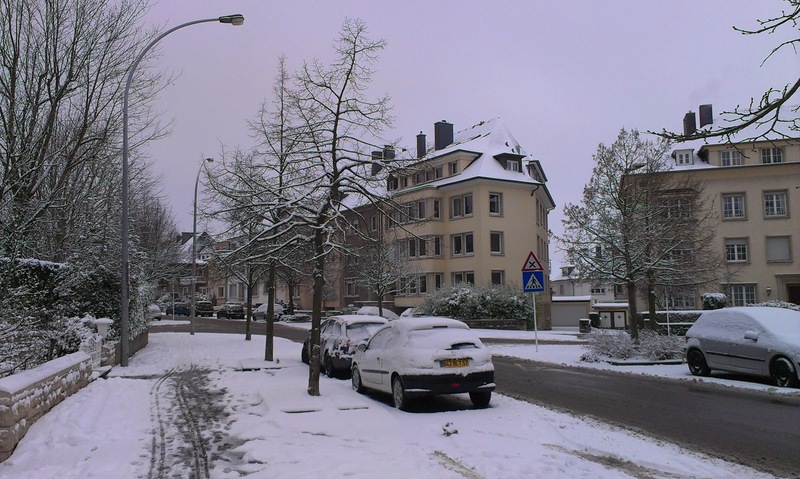 This is a common issue and fairly easily dealt with; Pete simply asked a co-worker who commutes from Germany (again, common) if we could ship it to her place and she could bring it on the way to work. 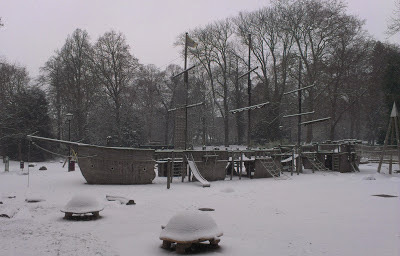 So, we were all set! Meanwhile, a mom from school tipped me off that a little tree lot had just sprung up only a few blocks from our apartment on the other side of Merl Park! 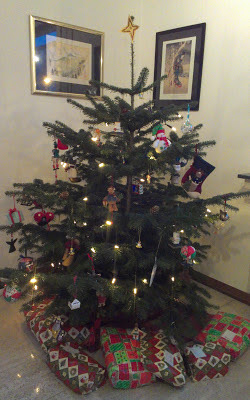 I went over, just to look - they were really expensive, but suddenly I wanted a real tree all over again! I called Pete to see what he thought--after all, we could probably re-sell or return the artificial one---but between having to hunt down a tree stand and feeling a bit wasteful, we decided to try for a real tree next year. I also spotted another tree lot in a parking lot near the city center - so clearly, there will be real trees within reach next year. A couple weeks went by and I finally asked Pete if there was any news on our tree (not exactly sure why I didn't ask before then, maybe I hadn't wanted to seem too pushy or eager or make him pester his coworker). But upon hearing the question, Pete's eyes popped wide open! "Oh! I forgot to tell you! She was in a car accident!! She's okay, but she's in the hospital and we don't know when she'll be back at work!" Okay, so then I just felt bad. I felt really bad for the woman. 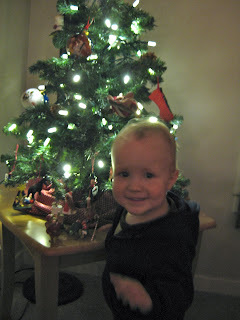 And I felt bad that we didn't know if/when we'd get our tree. And I felt the most bad for even feeling remotely bad about our stupid tree when a poor girl had been injured in a car accident. Still, I resigned myself to patiently waiting for our tree. It sounded like Pete's co-worker would be back before Christmas at least. But a couple of days went by, and possibly because this is our first Christmas away from "home" and family, I started feeling like I needed a tree sooner rather than later. 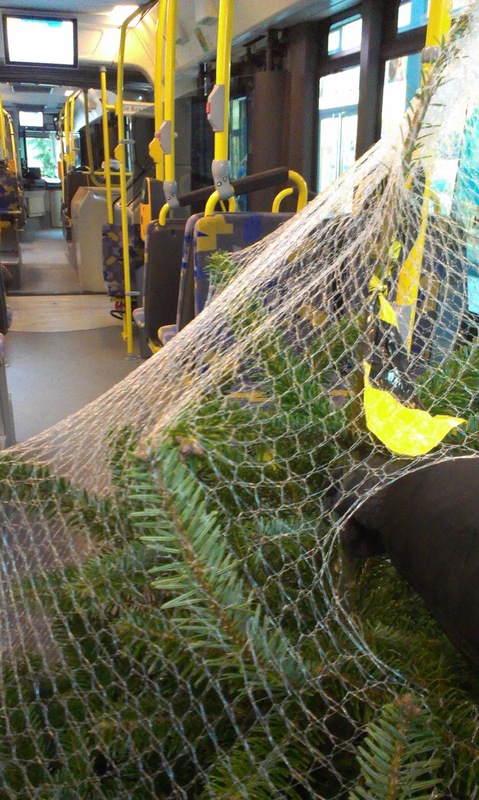 When I shared my predicament with a couple friends over a croissant in the city center, joking that I could take a tree on the bus, one of them remarked that she'd seen people do it. It was then I decided, I'm getting us a real tree! Today! 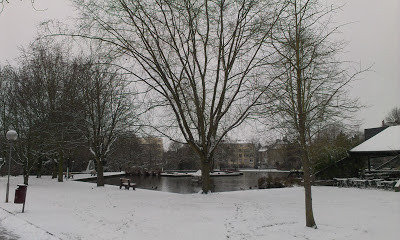 With an extra spring in my step, I walked from the city center over to the lot I'd spotted a few days before. These trees were quite a bit cheaper than the ones near our place (still not cheap), but they didn't sell stands. So I hopped on the bus to Auchan to pick up a stand and some tree lights (realizing for the first time that the lights in my Christmas storage box would not work with European voltage!). They only sold one kind of stand and the thing was 33 Euros! But it was clearly a quality German product, fancy, does all kinds of unnecessary things - but beggars can't be choosers, and I wasn't about to "shop around" for tree stands on the bus all day long. So I bought it and headed for the lot. The way I figured, this lot was a block or so from the bus stop for the bus that would put me about two blocks from my front door, and thus was actually a bit closer walking-wise than trying to drag a tree home from the lot at the park near our place, at which there was minimal tree selection anyway. So I picked out one of the smallest trees on the lot. Fortunately, the lots here neatly bag up the tree for you in a net. The gentleman assisting me asked if he could put it in my car for me. I told him I was taking the bus. He laughed. So I poked a hole through the net, grabbed the trunk, and started walking. The thing was 5 feet tall and pretty heavy, so I stopped to put it down or switch hands every 30 steps or so. After several funny looks at the bus stop, my bus arrived. Mercifully, it was nearly empty. 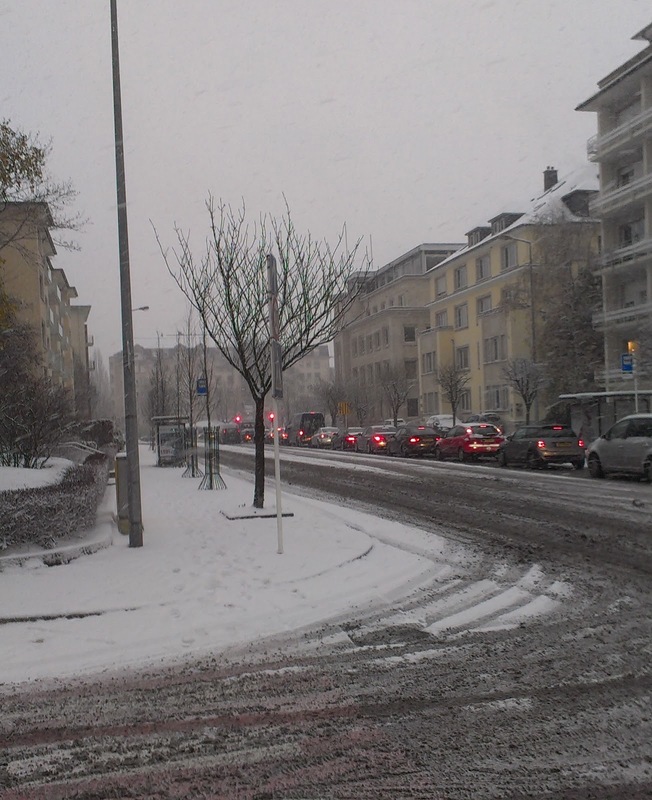 The two blocks and change from the bus stop to my door were tough, but I got my arm workout in for the day at least. 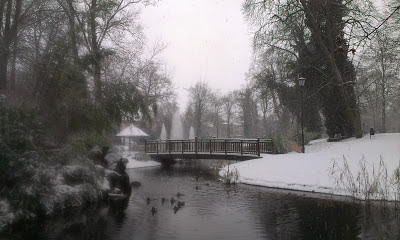 We've now had a couple of snow storms this December. 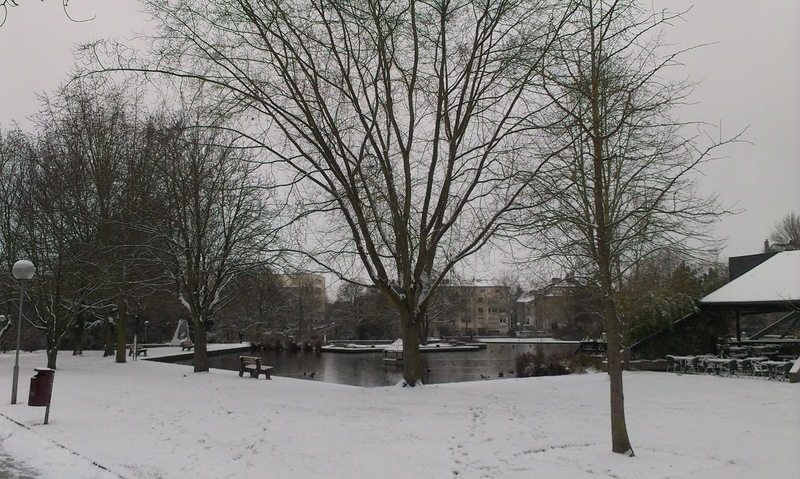 What follows is an exorbitant number of snow photos. 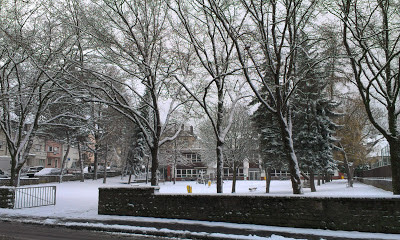 Snow is pretty. on my way to get groceries. happy to not be driving! 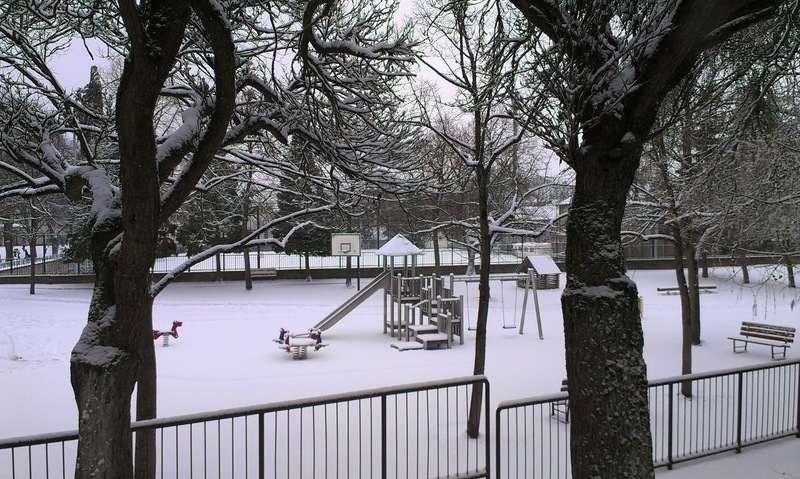 school yard yet another angle, and just a few minutes later, after the light changed. James throwing snowball! 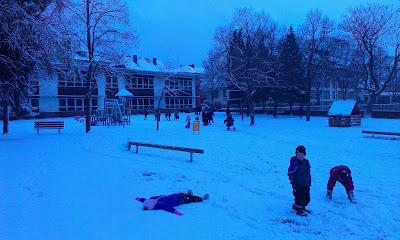 yep, more school yard. 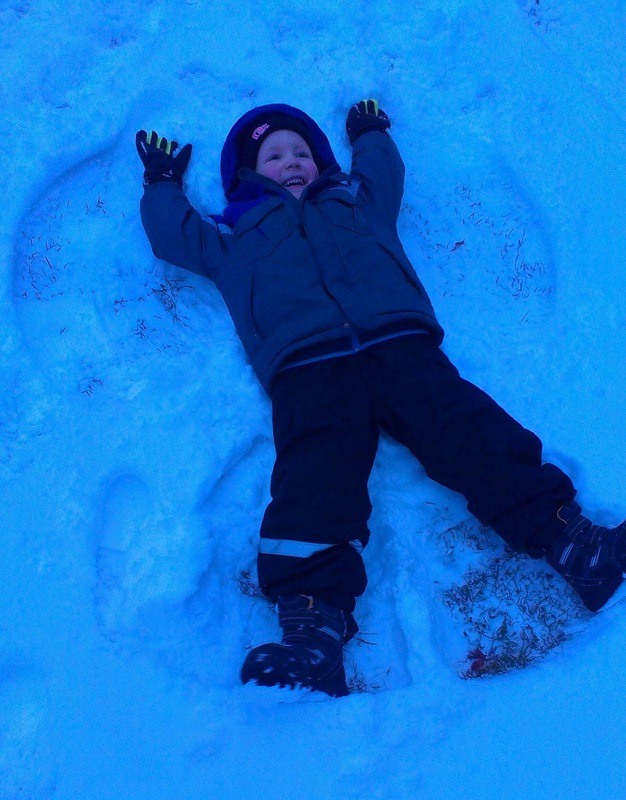 Daphne might be making a snow angel. She might just be tired. Exactly one year ago, Pete visited Luxembourg for the first time. As part of his weekend stay with a friend, he experienced his first Christmas market. 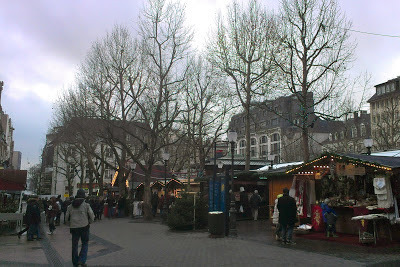 The Christmas market is a common phenomenon in European cities. 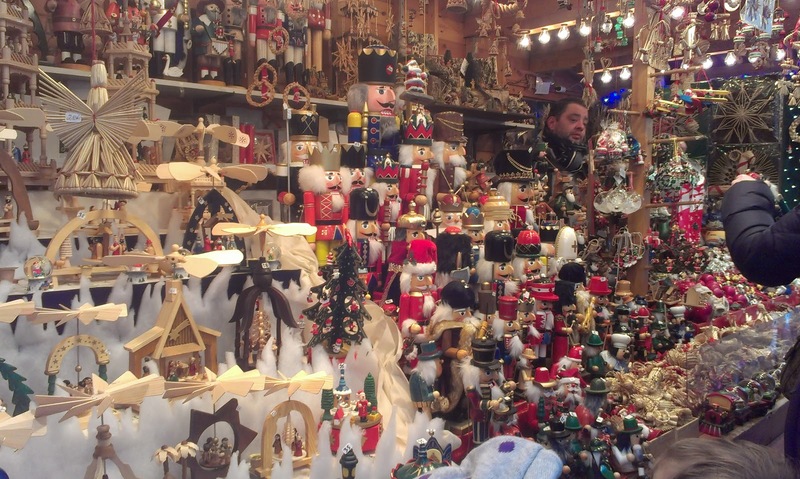 It's typically held in the town square and lasts for all of December, and consists of several wood huts selling trinkets, gifts, food, and hot mulled wine. "During a particularly grim assignment for my last company, I was marooned for about four weeks in rural southwestern France. However, since I couldn't go home on the weekends, the company paid for me to travel, and since I only knew one person in all of continental Europe, I figured I'd pay him a visit. Thanks, Matt! Me: So... what's everyone drinking? 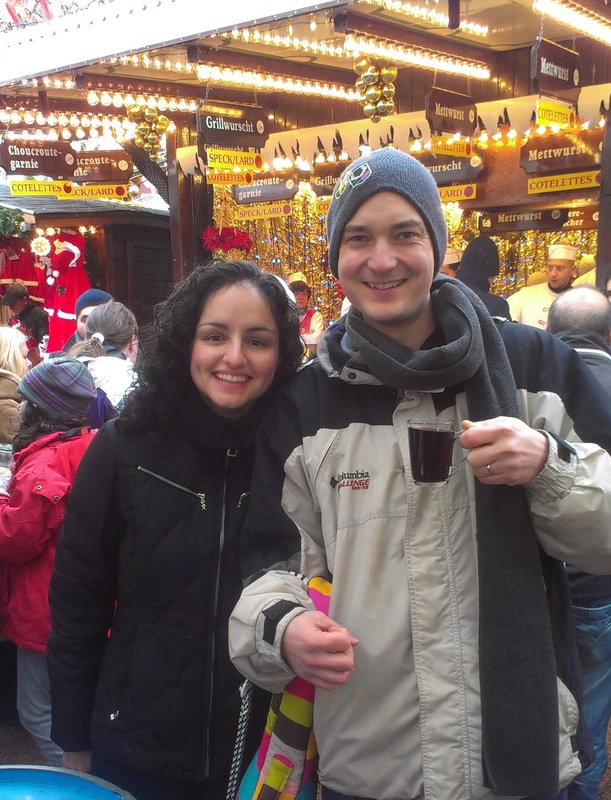 Matt: Glühwein - it's like a hot sweet wine for the winter. Me: (now drinking and thoroughly enjoying a Glühwein) Wow this is good! And it looks like everyone is enjoying sausages too! Me: (now drinking Glühwein and with a mouth full of Nutella crepe) Mmmph mmmm uhmm mm mmm? 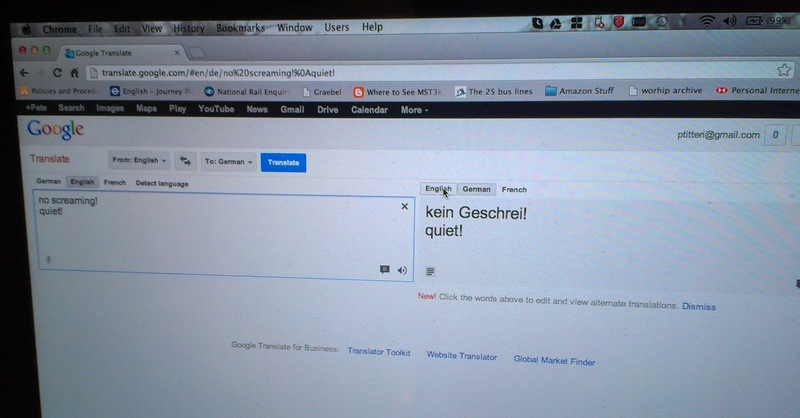 -- translation --- "and this happens how often?" Matt: Uh, every day in December up to Christmas. Me: So let me summarize. 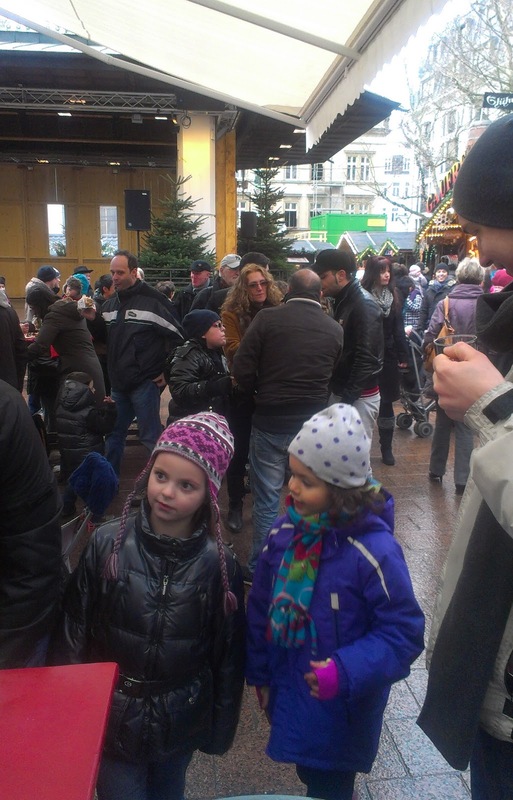 So... everyone just gets together in the middle of town to drink mulled wine, sing Christmas songs, and eat sausages and crepes? Everyday? At this point it clicked for me that Europe/Luxembourg has some things figured out. 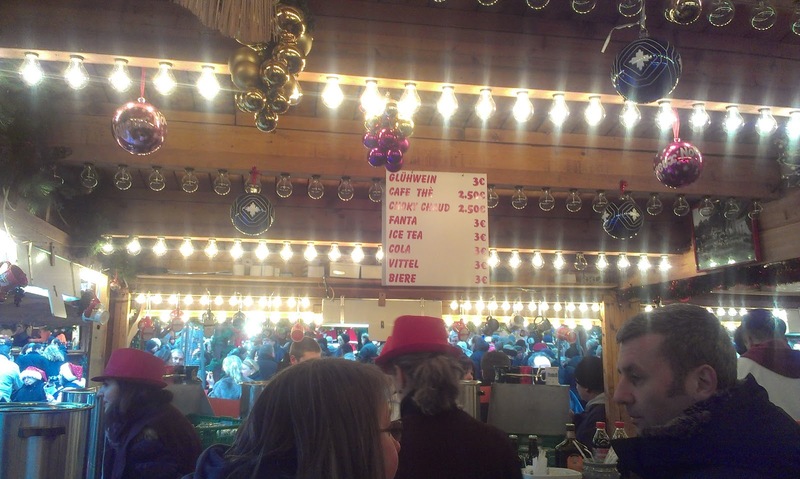 It doesn't get much better as far as simple-community-pleasures-on-a-winters-day go than hot wine and street food, and all your friends in the same place. For some reason, it just made sense to me that if the people and the city of Luxembourg were this serious about The Christmas Market, then this would be a good place to live and raise a family. Dubious logic I suppose, but there you have it." Yes, there you have it. 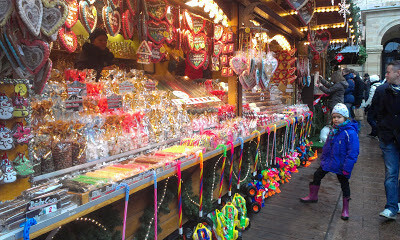 So a couple weeks ago we all stopped by this "famous" Christmas market on our way home from church. A few of the huts provided some semi-indoor space, a welcome shelter from the cold. and of course, some Glühwein. 1 euro deposit for the mug. 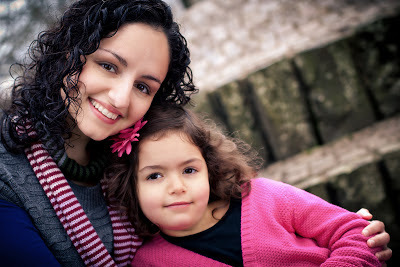 Daphne found a classmate, so we stopped to enjoy some street food with her and her family. 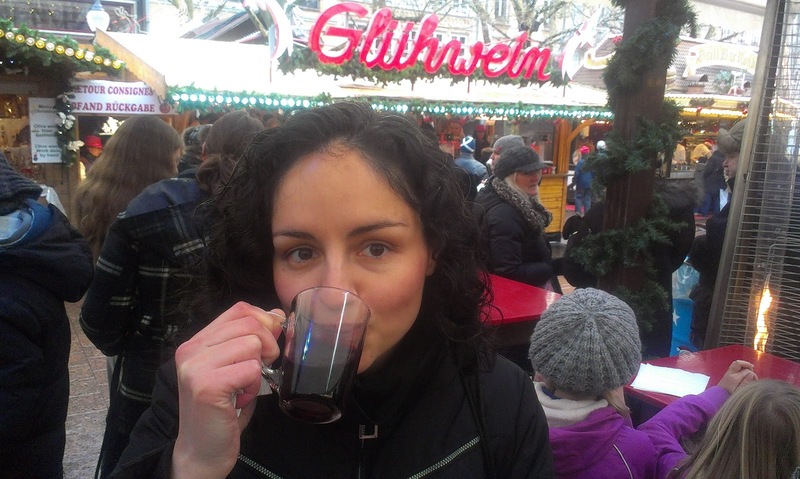 And finally, for the big news of the day (and those of you who know me well will know why this is big news), I tried the Gluhwein - and liked it! It was quite sweet with a lovely mix of Christmasy spices. I stole Pete's so he had to go get another! Verdict: the Christmas market receives my solid stamp of approval as worthwhile Christmas tradition. I'll take this over a shopping mall or Black Friday any day. Although I don't think I'll be partaking in the retail aspect, the market itself supplies a pleasant atmosphere and experience. It's truly a simple community pleasure, so right up our alley. My only complaint is that it can be quite cold standing around outside, but that's what proper winter clothing and Glühwein is for!! The 6th of December is a special day in Luxembourg - the celebration of St. Nicolas. 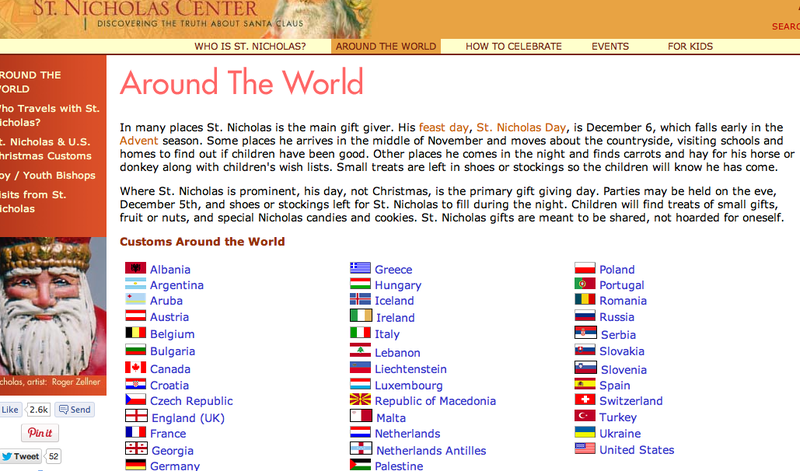 I assume that many Americans think St. Nick is just another name for Santa Claus. I did. Turns out, it's not that simple. 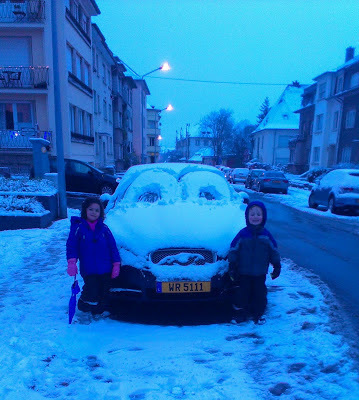 At least in Luxembourg it's not. 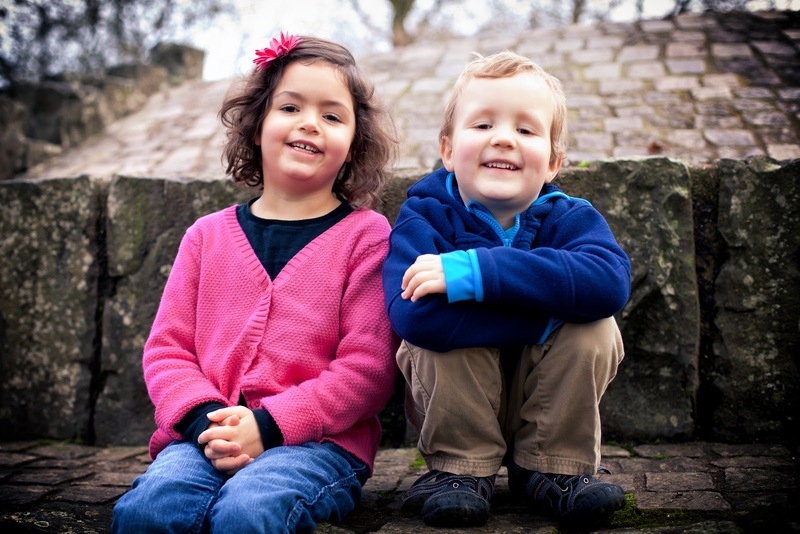 As our kids are in the local schools and we'd like to incorporate a little Luxembourgish tradition into our lives, we wanted to find out what we're "supposed" to do for December 6th. 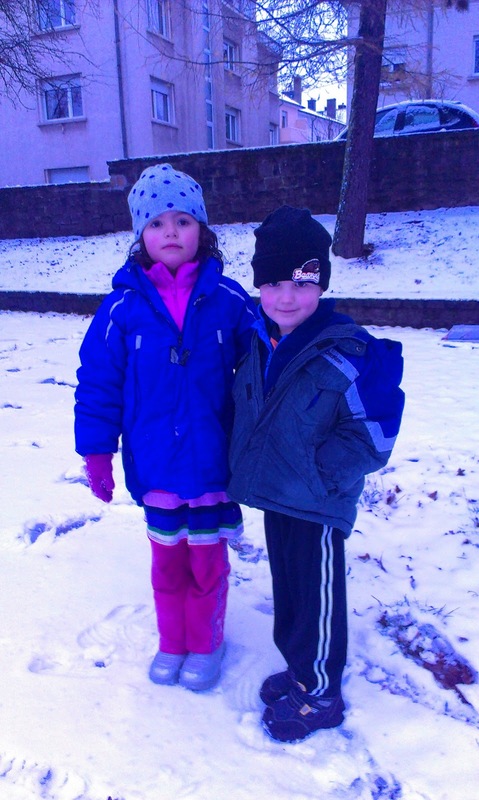 I knew there was no school the elementary grades this day, that it's kind of a big deal, and that Daphne and James were talking and singing songs about "Klees'chen" beginning in sometime in November. 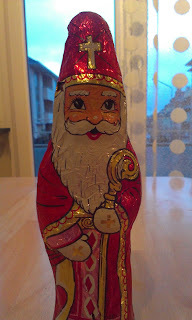 We soon deduced that this is the Luxembourgish name for St. Nicolas. 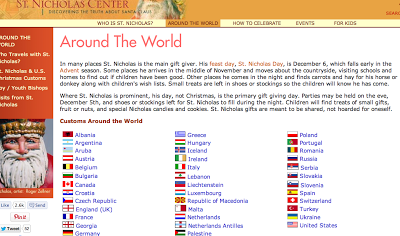 The St. Nicolas Center website is a great resource for St. Nick background and traditions. 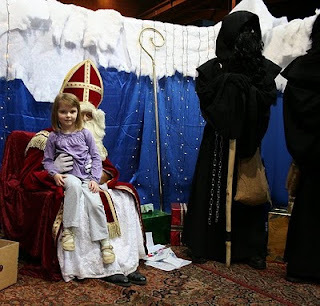 "During November, St. Nicolas, known as Klees'chen, comes to Luxembourg to check and see if the children deserve any presents. He is also found in shops where children have pictures taken with him. For days and weeks before St. Nicolas Day on December 6th, children put their shoes or slippers on the windowsill or in front of their bedroom doors. During the night, St. Nicolas may drop chocolates or other sweets into the shoes as he travels around learning about children's behavior. He also visits school classrooms. On the Eve of St. Nicholas Day, children put a plate on the table for St. Nicolas to fill with sweets when he comes with gifts. A donkey carries the toys and sweets and Nicolas is accompanied by angels or maye Housécker (Black Peter or Père Fouettard) who brings a bag of switches. In the past, Nicholas' gifts were oranges, nuts, and perhaps a pair of socks. 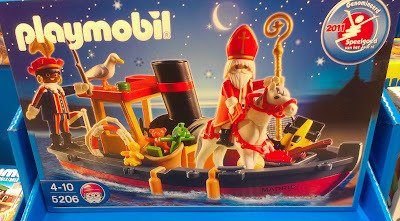 Now, however, they might be Lego sets or even fancy electronics, as St. Nicholas Day is the primary day for gift giving." found this set at the local hypermarket. A Black Peter rides on the back. In some traditions, St. Nick arrives on a boat from Madrid. No, I didn't buy it. You're probably already catching on to how navigating Klees'chen Day is not as simple following the instructions on the Luxembourg St. Nick page. In a nutshell, the way people celebrate the December holidays in Luxembourg is as diverse as the country itself. 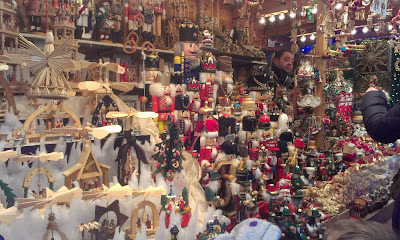 As far as I know, if you are Luxembourgish through and through, December 6th is the day that gifts are exchanged, and nothing of the sort happens on Christmas Eve and Christmas Day, whether or not you celebrate the birth of Jesus at that time. 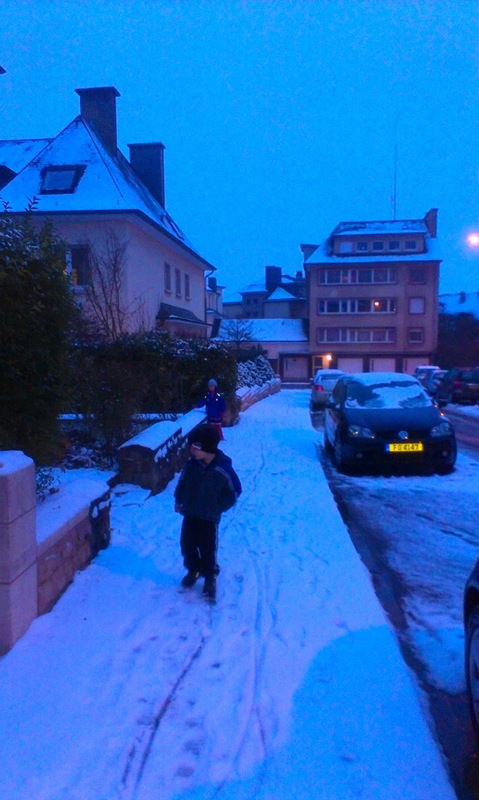 Yet "Luxembourgish through and through" only describes a handful of the population, even in the local schools. When I asked a few expat friends from various countries who have their kids in local schools about their traditions, this unfortunately only left me more confused. 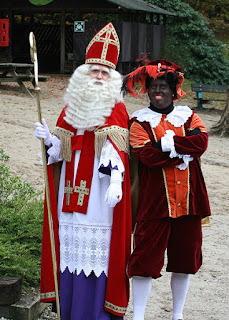 Some consider St. Nick and Santa Claus two completely different fellows, and invoke each one on his respective "eve." Sometimes the two guys even know each other and trade notes on the kids' behavior! Some do boots, some stockings, some shoes, some slippers...some do chocolates, some coins, some small gifts, some big gifts, some sticks, some coal.... 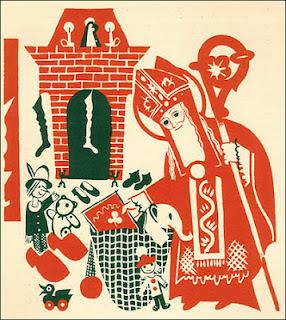 I figured that some Catholics in the U.S must celebrate a more traditional St. Nicolas, but now I know that in some cities, particularly in the the midwestern United States, St. Nick and his traditions are very widely practiced on the 6th. 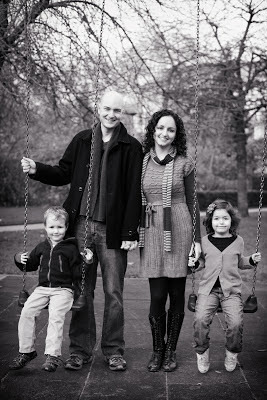 What's especially tricky is that although we'd like to embrace the traditions of our newly-adopted country, our little family has never even done Santa, and would rather not start. I will restrain myself from ranting against Mr. Claus and the whole "system" surrounding the guy, but suffice it to say, we'd just rather take a pass, and that it doesn't actually have much to do with the fact that we are Christian and do celebrate the birth of Jesus on Christmas. We exchange gifts on Christmas, but they're all from real people. Thus, it's basically the same deal for us with Klees'chen - Luxembourgish tradition or not, we'd rather not elaborately lie to tell the kids he's real/currently alive and that he's really checking to see if they're bad or good and bringing them stuff accordingly. (Ok, so I mostly restrained myself). So, in the end we decided to celebrate today by giving the kids a small gift (not inside any footwear) and saying "Happy Klees'chen Day!" Daphne asked if it was really Klees'chen who brought the gifts. 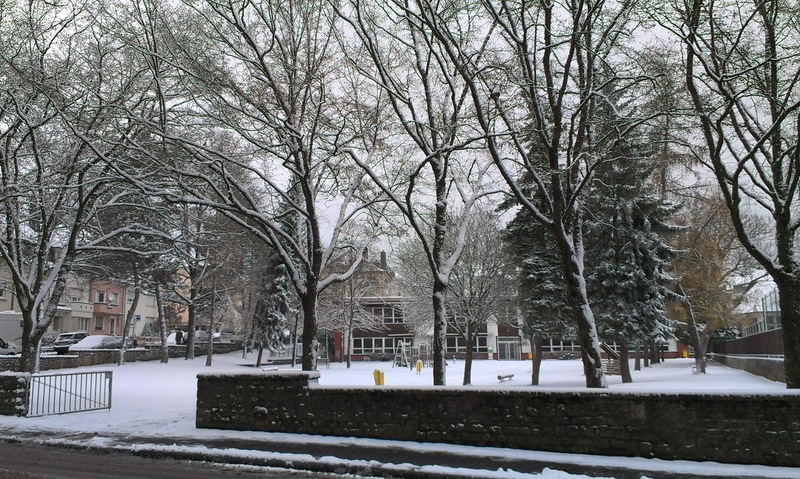 We said no, we just give gifts on Klees'chen Day in Luxembourg because Klees'chen was a man who lived a long time ago who was known for his generous giving, but to please not mention this to the other kids at school. 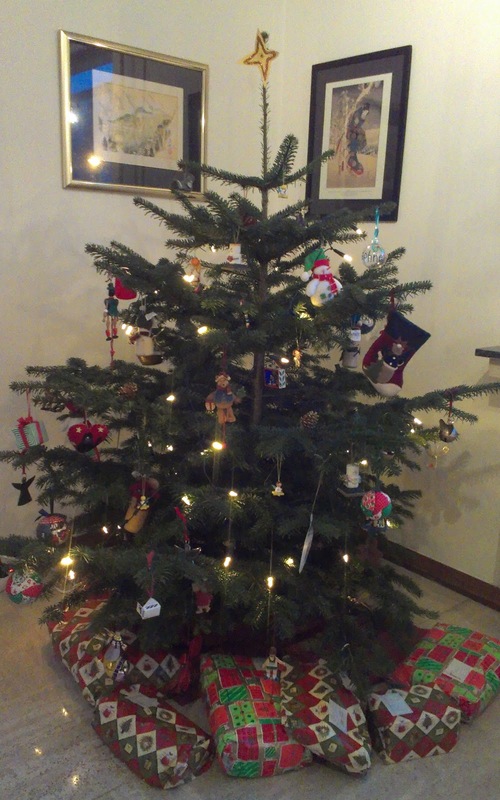 We also decorated our Christmas tree. I have to say, if I was to celebrate at St. Nicolas, Klees'chen, or Santa Claus, or even exchange gifts as we'd typically do, I'd actually much rather do it on the 6th! As our family does celebrate the birth of Jesus on Christmas, I'm all for keeping this other bit separate. 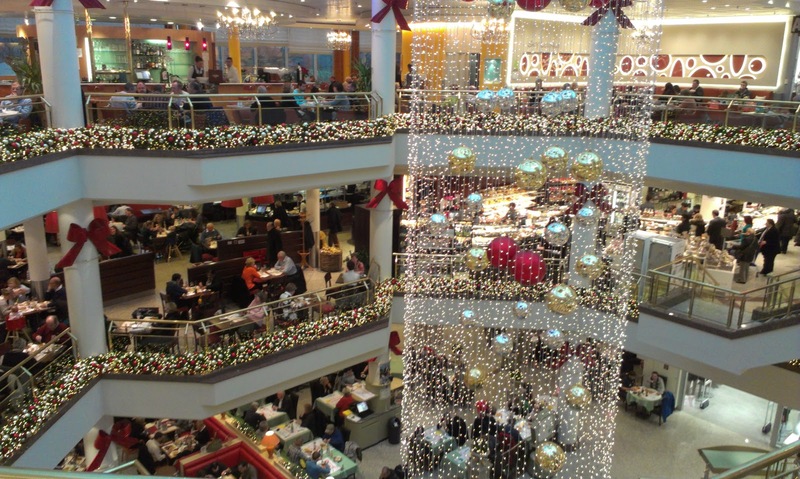 U.S. St. Nick Day Celebrations - including a photo from Portland, Oregon! A special connection between Luxembourg and an American St. Nicolas, 1944. - you might need a Kleenex handy. You can also watch the films here.